Halloween is a time when people frequently pay homage to pop culture influences, athletes, icons, and pop stars. At Maniac Pumpkin Carvers, we like to pay homage to our biggest influences as well. 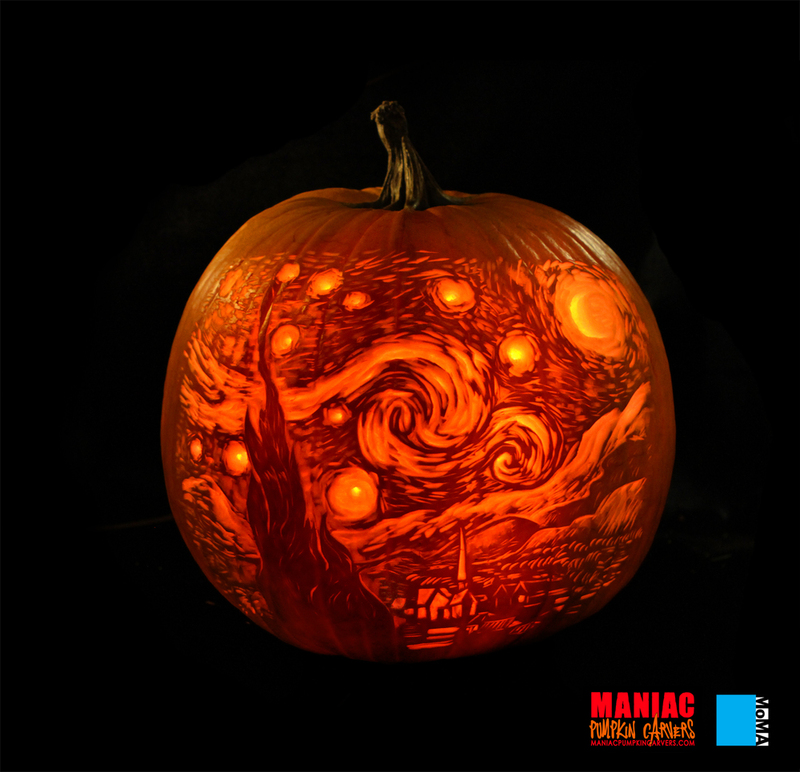 Each year since we started Maniac Pumpkin Carvers, we have reinterpreted several extremely detailed, famous works of art into pumpkins, as part of our Artists Series. In 2014 we created the first ever gallery exhibition of pumpkin art at The Cotton Candy Machine gallery in Brooklyn, NY. Each of the 16 unbelievably detailed pumpkins was inspired by an artwork by a contemporary artist who shows at the gallery. Our Artist Series has also been recognized by the Museum of Modern Art. For the past 7 years we had the honor of reinterpreting a famous work of art on display at the museum. It is always a highlight of our season, carving a masterpiece for the Museum of Modern Art. We have also carved for the Queens Museum of Art, The Whitney Museum, COSM, and many top agencies, galleries, and other businesses across all forms of media. Maniac Pumpkin Carvers have continually raised the bar with our Artists Series, elevating pumpkin carving from craft to art form. Have an idea and want to collaborate? Contact us! Artists series pieces are among the most labor intensive pieces that we produce, but the effort is well worth it. Contact us for availability, as pumpkins including this level of detail require additional lead time. "FINDING IMMORTALITY ONE PUMPKIN AT A TIME."